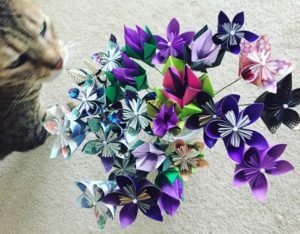 Then a friend wanted to commission some paper flowers for a lady. Valentine’s Day was approaching, but this was more for her upcoming birthday of 25 years, and thus, I made 25 flowers involving mostly purple. They took a long time to create, and ultimately, I decided to just provide the assembled flowers without further decorating the bouquet, as apparently the cost of floral arrangement supplies can add up quickly. 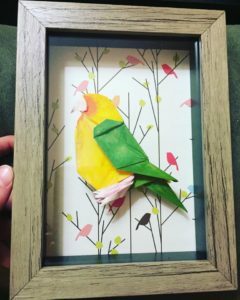 This allowed her to put her own finishing touches on the gift making it more personal. The woman it was gifted to is someone who enjoys origami also, and I am told she loved them. Of course, my original plan was grandiose, and at the time I finally snapped a photo, I was juggling a million things, in a hurry, and running out the door, but they still turned out nice (and hey, a bonus boop from my cat). 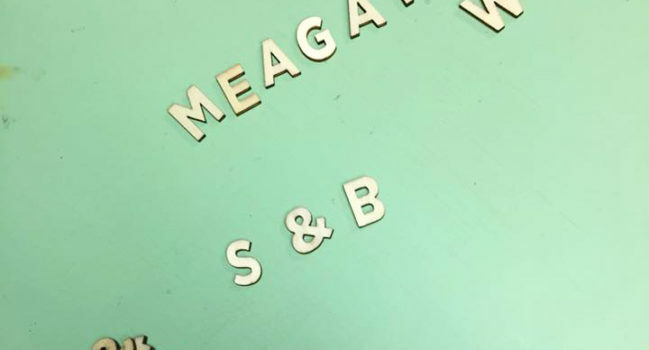 Another friend of mine was looking for something small-ish/affordable to gift a friend for her birthday. She told me that this friend of hers had a pet love bird that she adored. His name is Giacomo, and one day while he was out on the porch, he got spooked. He flew away and was lost for weeks. Then one day, a couple was walking home from a badger game, and Giacomo landed on one of their shoulders. 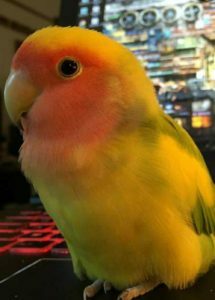 As luck would have it, it happened to be the shoulder of another love bird owner. If nothing else, this was fortunate as they already had everything needed to care for him, understood the love for such a snuggly feathered friend, etc. plus, it’s just a delightful coincidence. Having spread the word far and wide of her lost Giacomo, she was quickly reunited with her little dude. My friend, Misti, asked if maybe Giacomo could be also immortalized in paper. 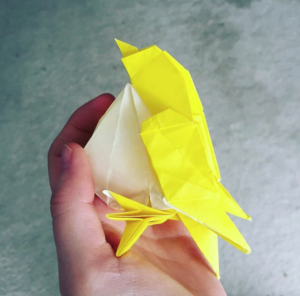 She showed me a very simple origami bird that she had googled, but I wasn’t satisfied with the level of complexity. 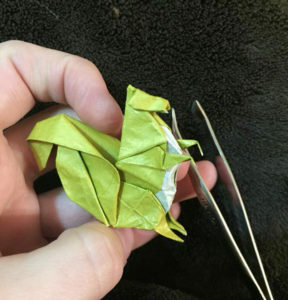 If we are to create this beloved bird out of paper, we should get down to the details and make it a proper paper twin of close resemblance, even if it takes a lot of time. If it were simple and rudimentary, then you could ask anyone to make it- she came to be for my folding abilities, so I don’t want to disapoint. I searched my pile of books but didn’t find anything that was very close. I searched online and found a design in Japanese by Hideo Komatsu. It looked more like a sparrow or junco, but I thought, I can modify that (and thus, make it more my own, much like using a WordPress theme and customizing it- ha). I found a digital version of the magazine/journal in which Komatsu’s diagram was featured and printed the Japanese pdf. Thankfully, it was very easy to follow despite the language barrier (as Google Translate left much to be desired here).